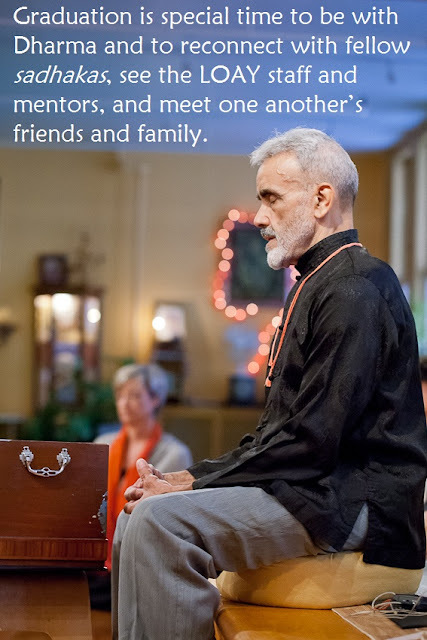 Sri Dharma Mittra is always passing on knowledge from deep within the wells of his being. It may be hard to grasp, or to remember for some, or maybe some of the words to a mantra are elusive. Since the recent publication of the Dharma Yoga Life of a Yogi Teacher’s Manual, all of these techniques that will put you on the fast track to Self-Realization are available at your fingertips. 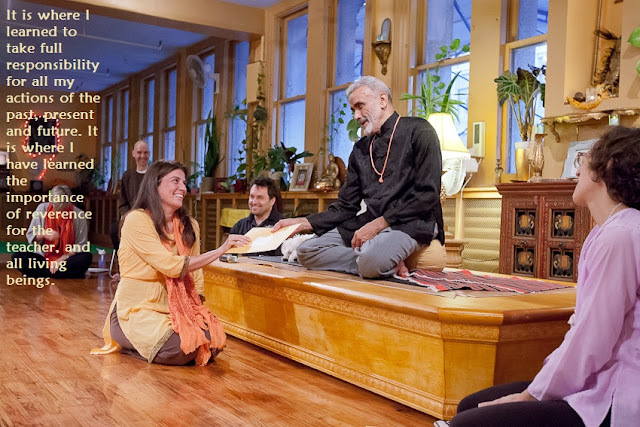 The beautiful book was set to motion by Sri Dharma’s wife and longtime disciple, Eva Grubler, aka Ismrittee Devi Om, with the help of Life of a Yogi teacher training director Adam Frei. For two-and-a-half years, Adam had a series of meetings and conversations with Sri Dharma during which they slowly went over all of the basic material. The deep information given during teacher trainings has been compiled in the book, along with old photos of Sri Dharma, charts he drew by hand, and a bunch of yogi recipes that will prepare the body to go to the higher levels of the practice. I especially love all the mantras from the lineage spelled out and translated, and the breathing techniques. These have helped me as a teacher and student. It’s good to study and practice these properly while you’re on your own. Then when you practice with the master you can go much deeper with confidence. There’s a breakdown of the main yogic texts and just about all things yoga. One of the things I love about Sri Dharma is he makes all this knowledge available to anyone who cares to seek it out: teacher trainees, students, or anyone else. 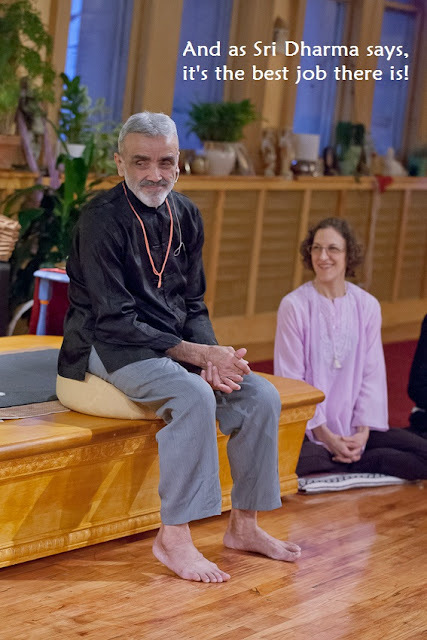 Sri Dharma emphasizes the importance of personal practice. There’s also a section in the book on what practices to do, especially if you are one of the many people with limited time. 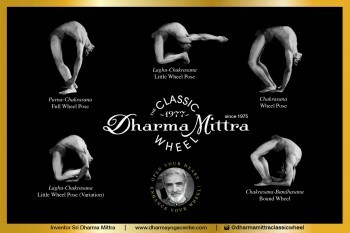 For a man who is widely known for his stunning asana, Sri Dharma is always talking about how the poses are not important. Just the basic ones will give you what you need as you continue on your path to the higher limbs of concentration, meditation, and Self-Realization. Remarks on "The Shiva Samhita"
The Shiva Samhita is a collection of verses of Shiva, which are in the form of a dialogue with Parvati. The text contains the essence of Yoga as well as more esoteric teachings. This post will briefly touch upon a few of the important themes of this text. The Shiva Samhita claims to contain the “consummate” teaching of Yoga and therefore the aspirant need not concern him or herself with other sacred texts. The text succinctly teaches the laws of karma as, for example, in this verse: “Through the power of sin there is sorrow; through the power of good deeds, pleasure. Therefore, one who desires pleasure must perform various types of good deeds” (7). Heaven and hell are the results of good and evil deeds (6) but Heaven and hell are not forever because when the results of good and evil deeds are exhausted one is born again (7). Karma is the cause of everything that appears and not just those things that appear pleasant or unpleasant, as stated in this verse: “Everything that is seen in the world results from karma. A living being reaps rewards according to its karmas” (35). It is through renunciation of both good and bad deeds, however, that the yogi begins to acquire the highest knowledge (8). Says Shiva, “That which impels the workings of the mind into bad and good acts is me” (9). The yogi understands him or herself to be the instrument of the higher Self or God. As Sri Dharma teaches, “I am not the doer.” Indeed, everything is God, as stated by Shiva, “nothing in this world is different from me” (9). The highest knowledge of the nature of reality leads to liberation, as pointed out in the verse “suffering is destroyed through true knowledge, resulting in a happiness without beginning or end” (15). The Self or God is this eternal knowledge which, when realized, destroys ignorance — the cause of the world — and the world itself. Shiva says, “It is Maya [illusion] who is the mother of the universe. She can be completely destroyed by one who knows the truth. When she is destroyed, the universe no longer exists” (16). Therefore, the importance of a guru to the aspirant on the path of Yoga cannot be stressed enough. In the words of Shiva, “After finding a guru knowledgeable in Yoga and receiving instruction in Yoga, the yogi should carefully and resolutely practice in the way taught by the guru” (45). Similarly, Sri Dharma teaches that “The role of Guru is of the highest importance, as is the sincerity, humility, and loyalty of the student” (The Importance of a Guru in Yoga Tradition). There are precisely six marks of perfection in an aspirant which are enumerated in this text as follows: “The first mark of perfection is the conviction that one’s practice will bear fruit. The second is having faith, the third is honoring one’s guru. The fourth is equanimity, the fifth restraint of the sense organs, and the sixth curbing of the diet. There is no seventh” (44). Similarly, Sri Dharma teaches that “Diet is very important.” Again, Shiva: “Until the practice is complete, the yogi should resort to a restricted diet. Without doing so, the wise man is unable to carry out the practice in this life” (159). Through the practice of meditation, the aspirant stills the mind of all activity and realizes wholeness, or absolute identity with the Self or God. Shiva teaches that “Having made the mind free of fluctuations, the yogi automatically becomes complete” (155), and as a result, the yogi sees unity everywhere and is eventually liberated (156). The Shiva Samhita 5 (James Mallinson trans., YogaVidya.com 2007). Please note that all parenthetical citations are to this edition. Yama Om studied religion and philosophy for two decades at universities in the U.S. and in Europe. He was blessed to have worked with some of the world’s great teachers, including the Dalai Lama and the Archbishop Desmond Tutu, whom he served as a teaching assistant. 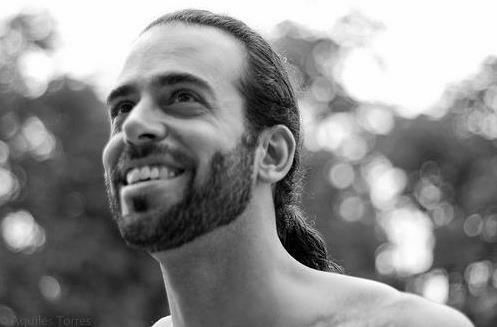 Yama began studying yoga in 2002, but it was not until 2008, the same year he completed his Ph.D. in Religion, that he met his Guru, Sri Dharma Mittra. Over the next five years, Yama completed the 200, 500, and 800 hour “Life of a Yogi” Teacher Training Programs. As a public interest attorney, he works to prevent homelessness by providing free legal services to poor people facing eviction or foreclosure. “Bhagavad” means “God” and “Gita” means “Song.” “Bhagavad Gita,” therefore, can be translated as “The Song of our Lord.” Krishna, one of many incarnations of The Lord, explains that he lives in each and every one of us, meaning that “Song of our Lord” is also the song that praises the beautiful divine within each one of us! As I type these words my heart cries tears of joy. 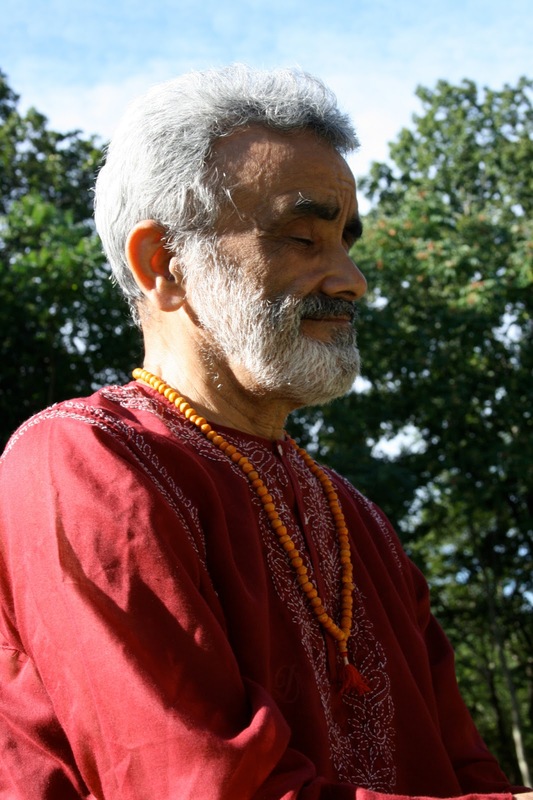 I feel so fortunate to have found the Gita and to have found Sri Dharma Mittra. There are four core concepts from the Gita which extolls the beautiful potential that exists vibrantly in each one of us and, indeed, in every atom of the entire cosmos, known and unknown, seen and unseen. Dharma can mean “law of the universe,” “social and religious rules,” and/or one’s own individual mission or purpose. On the individual level, it can also mean a number of things. For example, in the Gita, Krishna points out to Arjuna that his Dharma is to be a warrior whether he likes it or not. He cannot escape his Dharma and he must fulfill it. Arjuna is a warrior for what is right and just. He is not just a warrior for fighting’s sake. His Dharma must be grounded in a proper purpose. Whatever role we are fulfilling at the moment is our Dharma at that moment. Applying this on a personal level, I followed my Dharma as a Finance and Accounting professional for the last 30 years. 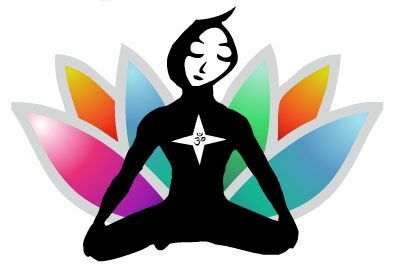 Recently, coinciding with my new practice of Yoga Asana and study of Hindu or Yoga scriptures, I began to find less and less meaning in my profession. 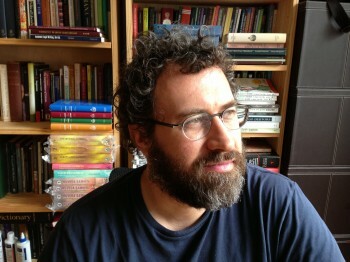 I am now in a period of transition, seeking to find a new and more meaningful personal Dharma. I am a “householder” (someone who lives among and provides for his or her family), and as much as I would love to throw caution to the wind and become a Sadhu, I need to be mindful of the effect of my actions on those around me. Therefore, following the counsel of the spirits, I am proceeding on a step by step basis, finding my way with the Lord’s merciful guidance. Both Hinduism and Buddhism extoll this virtue of absolute commitment. In fact, many books have been written about the power of focus and single-mindedness, including the Gita. I first learned about this concept when I began practicing Buddhism in 1977 and I poured myself wholeheartedly into my career development. As a result, I was very successful from a materialistic standpoint. Success in life is no accident and it is a result of pursuing one’s Dharma full out, no holding back. Upon looking back, I see that I did not always carry out my Dharma as a husband and father and I have made mistakes that have impacted others’ lives unfavorably. Had I had the vision to take the longer and broader view on things, I may not have made these mistakes. I feel that I was more concerned with material success at any cost, even if others had to pay a price. I now see that I was not acting properly in these and probably many other cases. In this last chapter of my life, I would like to pursue my new Dharma with more mindfulness and focus on proper context and big picture focus. 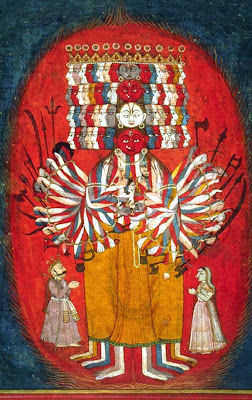 Krishna displays hisVishvarupa (Universal Form) to Arjuna on the battlefield of Kurukshetra (Bhagavad-Gita, chapter 11). The Gita exhorts us to release this incorrect view and to realize that our self and the phenomenal world at large are not real. What is real is “Self,” the divine within all life, sentient and insentient. Even the air we breathe has the divine nestled in every particle. Therefore, instead of jealously guarding our self-worth, we are much better letting all that go and acting out of gratitude for the opportunity to work on our Dharma. Krishna says we our entitled to work, but not to any of the fruits of our work. When we adopt this attitude, all we can feel is gratitude, no matter what happens. I have found that as I endeavor to embrace this concept, I am shown which areas need work and I am grateful to be shown these things and grateful to be able to improve so I can one day serve others with gratitude and without attachment to the fruits. I feel this concept is closely related to its predecessor. 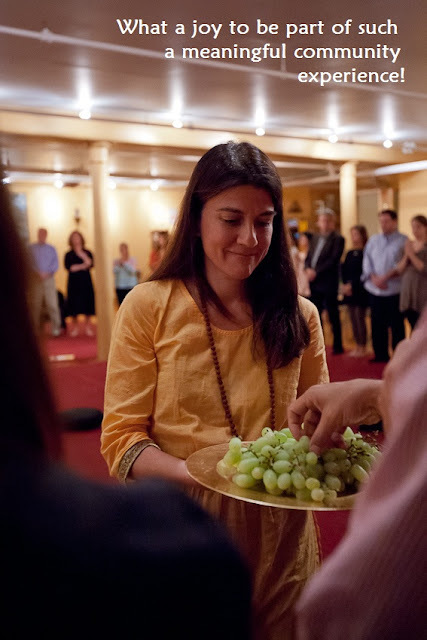 How much easier it becomes to let go of the fruits when one is offering every moment up to the divine. The ultimate form of this is when one feels that God is acting through him/her. In truth, this is what is happening all the time, we just fail to see it and that failure results in suffering and angst. I believe this last sentence resonates with this fourth core concept from the Gita upon which this post is focused. It provides a very practical way to begin to incorporate this concept in one’s life. Begin the day focused on God and end the day focused on God. What a beautiful way to live! Om Namah Shivaya. Gary Mark has practiced yoga for the last three years and studied Bikram and Dharma Yoga during this time. He has spent the last year studying intensely at Dharma Yoga Los Angeles and completed his LOAY 200-Hour Teacher Training and Certification at the Dharma Yoga New York Center in June to September 2013. Gary is currently enrolled in the LOAY 500-Hour Teacher Training at the Dharma Yoga New York Center. Mispronounced, misunderstood, and misconstrued, the sacred Om, or Aum, is the root of all mantras and contains all the sounds in the world. Yogis believe the Aum is one and the same as Brahman, or the ultimate reality underlying the phenomenal world. The Aum and all the mantras that spring from it are like asanas for the mouth and should be pronounced with care and concentration as well as with proper motivation, faith, devotion, and understanding. 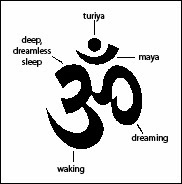 In the scriptures, the Om or Aum is also referred to as the Pranava, Omkara , and Udgita . Because the Aum is considered to be one and the same as God by many yogis and Hindus, it should be treated with respect. Having it tattooed on the foot or ankle or printed on a pant leg or across the buttocks or on shoes or a meditation cushion or a yoga mat (where the feet step on it), or placing the Om symbol on the floor are considered highly disrespectful by many Hindus and yogis. Knowingly offending others in this way is a violation of ahimsa, or non-harming. The first is the “A,” which sounds like the “a” in father and is pronounced in the throat, with the mouth wide open. It is usually fairly short. The second is the long, loud “U,” which rhymes with shoe and is pronounced with the mouth actively shaped like an “O”–not with a slack mouth. The sound rolls over the tongue. Then the mouth slowly closes and the sound becomes the “M,” which is pronounced mmmm with the lips together, creating a pleasant vibration. The fourth is the silence that follows. My guru, Sri Dharma Mittra, says that during the silence one should focus on the vibration behind the forehead and repeat Om mentally. and the M is the state of deep, dreamless sleep (the top curve). The silence that follows represents the fourth state or turiya –pure consciousness, the goal of yoga. It is represented by the bindu , or dot, at the top, while the curve separating it from the rest of the Om symbolizes maya , or illusion. and the M represents the causal body. It also contains the three gunas , or qualities of the phenomenal world that are constantly shifting: A is rajas (action), U is sattva (harmony), and M is tamas (inertia). Finally, Aum represents the Hindu trinity: the A is creation or Brahma, the U is preservation or Vishnu, and M is dissolution, or Lord Shiva. Yogis believe that what you are thinking of when you die is where you will go next. So if you only learn one mantra in this lifetime, let it be the Aum, which represents the supreme goal. If Aum is always on your lips when you are alive, it will be in your mind when you pass. There are many Aum meditations. This one is suitable for all levels. Face east or north. Sit tall on the floor or a chair, with the back of the neck in line with the spine. Inhale, and exhale, create a long, loud, resonant Aum. The mouth is wide open during the A, in the shape of an “O” during the U, with the lips coming together for the M (the M should last for at least one third of the Aum). Then remain silent and do an internal mental Aum, while focusing on the vibration between the eyebrows, behind the forehead. Then repeat – a verbal Aum, followed by a mental Aum. Keep repeating for ten minutes. This practice stimulates the pituitary gland, activates the sixth sense, and is an antidote to depression. 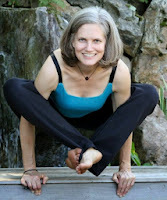 Kali Om (Cara Jepsen), E-RYT 500, lives in Chicago, where she has been teaching yoga since 1998. 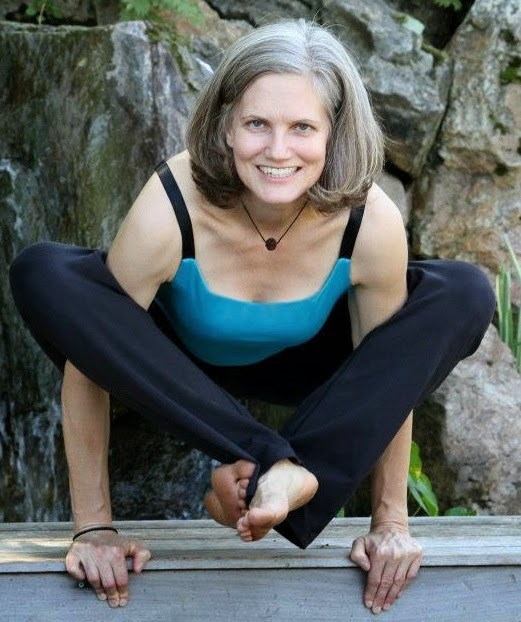 She first studied with Sri Dharma Mittra, in 1999, and has completed his 200, 500 and 800-hour teacher trainings. She also studied five times in India with Ashtanga Vinyasa yoga master Sri K. Pattabhi Jois and has completed trainings in Hormone Yoga Therapy, therapeutics, senior yoga and ashtanga vinyasa yoga. She also specializes in yoga for back care, yoga for depression, and yoga for menopause. She will lead a yoga and meditation retreat in Belize February 9-16 in near Chicago April 12-13. 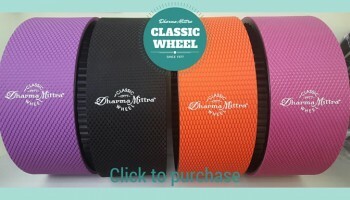 For more information, visit www.yogikaliom.com or e-mail kaliom108@yahoo.com. When reading through the Dhammapada, I found that many verses resonated with me and I wonder if this is because I read the verses with yogi colored glasses because I studied with Sri Dharma Mittra. When a modern day Guru such as Sri Dharma recommends a book, it makes it less obscure and more approachable. Certainly, many verses touched upon themes I learned in the Life of a Yogi (LOAY) Teacher Training program, and when reading, I imagined seeing Sri Dharma’s face with a glimmer in his eye! Because of the similarities between the words of the Buddha and Sri Dharma, it is no wonder that Sri Dharma recommends this text as an important read for any new or experienced yogi. There is a misconception that you must be a Buddhist or a person on a spiritual path seeking enlightenment to study the texts. In reality, this text is an important read regardless of one’s religious affiliation, because it transcends religion. In fact, there is no mention of religion at all. The book is not about religion or a higher power; it is about empowering the reader to be his or her best possible version by realizing that all the power is already within. (As I type this, I am aware of the strong correlation with how Sri Dharma encourages students to find their inner Guru). Jack Kornfield, who wrote the foreword of the Gil Fronsdal translation of the Dhammapada, himself touches upon this very concept in the introduction, where he points out the contrast between the opening verse in the bible and the opening verses in the Dhammapada. As the author points out, the bible “emphasize God’s role as creator and, by extension, our reliance on God’s power.” This implies that we are weak in God’s shadow. Conversely, the Dammapada reflects “the importance and effectiveness of a person’s own actions and choices.” This observation highlights how we are in charge of our own path and indeed, the masters of our own destinies. The entirety of the text is reminding us of this fact in every capacity and function. 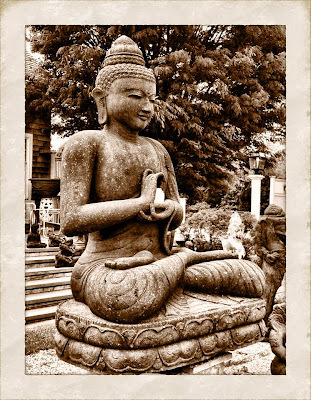 As the Buddha points out in the very first verse, it is our minds. “All experience is preceded by mind, led by mind, made by mind.” This sentiment reflects that Sri Dharma taught us that it is not we who are “bad,” it is our minds. It’s an important distinction, as it allows the individual freedom from our own thoughts and therefore actions – not to shirk responsibility of our deeds, but rather as a way to reflect on our own thoughts and regulate them before they turn into actions. According to the Buddha, our very experiences start with the mind! Is it any wonder, then, that when going into a situation thinking it will be bad, it usually is? To tie this into asana: if, before attempting a posture, the thought is, “there’s no way I can do that,” you are right and it will indeed be impossible to do. Sri Dharma, in his infinite wisdom has said, “If you can bend your mind, you can bend your body.” How liberating then to take ownership over your own experiences! The verse that I believe sums up the blueprint to living the life of a yogi is found in Chapter two, verse 25: “Through effort, vigilance, restraint and self control, the wise person can become an island no flood will overwhelm.” This is a powerful lesson to heed, as it sums up so much of Sri Dharma’s teachings. 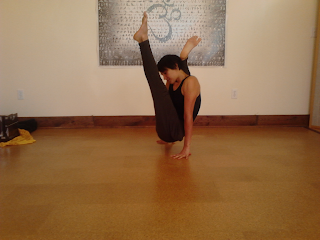 The Yamas and Niyamas, making an effort in asana — regardless of what happens around you, inside you are unchanged. This is essentially the same lesson from the Buddha to Sri Dharma just in different words! This concept is again reflected in Chapter 3 verse 38: “For those who are unsteady of mind, who do not know true Dharma, and whose serenity wavers, wisdom does not mature.” In essence, if you want to be wise, the reader is given the exact route to take to achieve wisdom. It is through steadying the mind, finding your Dharma and becoming serene. And the ultimate goal is to conquer oneself. I find this book to be a perfect companion to Sri Dharma’s teachings for a student like myself who is across the country from the center, or for a student who has never participated in a LOAY teacher training. While the words are different, the direction and ultimate goal is the same. If it is mastery of the self one is seeking, then the Dhammapada is a text that will help set one on the right path. Fay Inger is a 800-Hour Certified Dharma Yoga instructor living in Los Angeles, California. Fay is a private yoga instructor, writes blog posts on yoga and wellness and is learning nutrition to better help her students reach their health and fitness goals. As she always says, “yoga is a gift” and it is her favorite gift to share! Ishvara Pranidhana Om, simply called “Vara” by her students at Dharma Yoga Missouri, is a dedicated and reverent student of yoga. 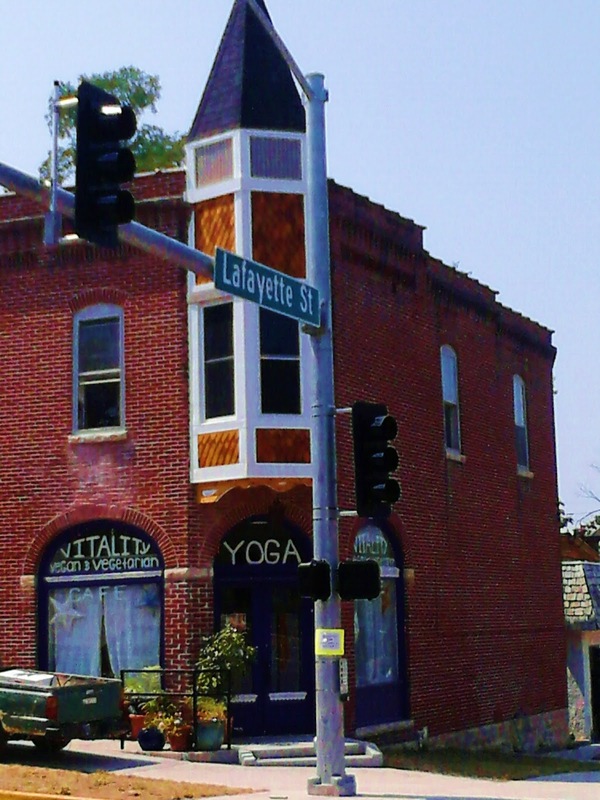 She has fully incorporated the practice of yoga in her life, running Dharma Yoga Missouri as well as the attached vegan café, Vitality (www.vitality-cafe.com). I live in Jefferson City, Missouri. It’s the capitol, in the heart of the state that’s in the heart of the Midwest. I lease a building that has Dharma Yoga Missouri along with Vitality, our vegan café, on the first floor. I live in the apartment upstairs with my two daughters and two cats. I like just walking downstairs and being at work. Which LOAY trainings have you completed? How did you come to do those trainings? I completed my LOAY 200-hour in June 2010 because I started subbing and needed to have formal training. Also, I took a weekend workshop with Dharma Yoga Teacher Rebecca Kovacs in San Diego, CA, that blew my mind and blew all of my perceptions about Yoga out of the water. 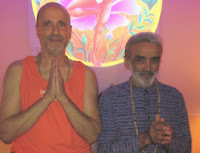 So I took a 24-hour trip to meet Sri Dharma Mittra for a Maha Sadhana the day before Valentine’s in 2010 to check out the facility and the teacher. I had watched his Maha Sadhana DVDs and his voice was something so old in my memory that when I met him in person I started to cry. Sri Dharma asked me, “What’s wrong with you, did you break up with your boyfriend? Oh, you just have some Shakti rising up” as he gestured to his heart. I was stricken and all I wanted was to be with him. So I signed up for the LOAY 200-hour teacher training. I took the LOAY 500-hour training because I was so happy about my first training and also so that I could teach all the levels at the center. When I heard that there was going to be a LOAY 800-hour I was like, “PUT ME ON THAT LIST!” At this point I have an overwhelming burning desire for liberation, it’s all I think about and I think that is certainly a result of such intensive immersion experiences. I think the LOAY 800-hour TT has been the one of the best experiences of my life so far. How have the people you met in the training inspired you? The people I met are a varied group of people, some whom I remain very close with to this day. There are people from every walk of life, all different ethnicities and from different parts of the world. I am inspired by the fact that we can all be so different, yet are all reflections of each other in our love for Sri Dharmaji and our quest for Self-Realization. What is one practice that you do every day? I watch the activities of the mind and pray constantly. I devote every action to God, and try not to be concerned with the activities of the mind, but I am always trying to observe it. I am consumed with thoughts of liberation, so I ask for Divine Help all the time. This is the easiest practice for me because I don’t always have time for asana and pranayama, or reading scriptures every day. 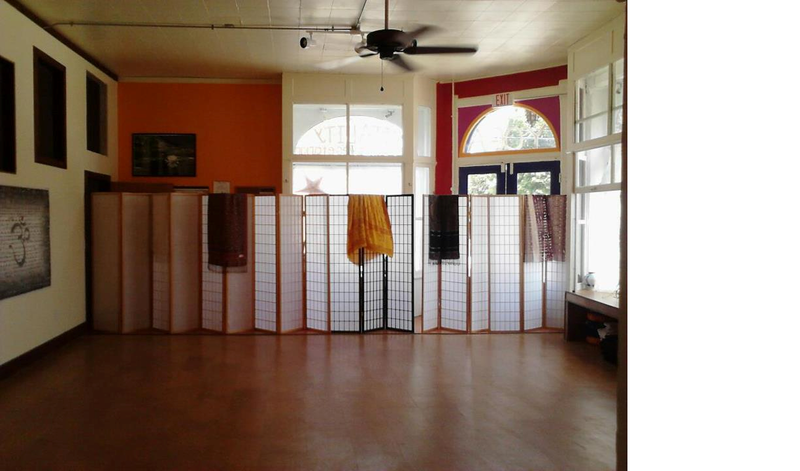 I opened Dharma Yoga Missouri in 2010, and three other trainees have taken the LOAY 200-hour training since then. I’m letting them take over most of my classes for the summer so I can focus on the Vitality Café. I will return in September with emphasis on teaching the Deep Healing Relaxation Series. I opened the Vitality cafe in my town because there is nothing like it for 150 miles in any direction! Vitality is named after the Vitality diet that I was required to follow during my LOAY 500-hour training. Vegan food is considered to be fairly radical here! Starting in September, our studio and cafe will be doing Fresh Start, a one month program on just raw food. Every day there will be recipes, inspiration, and a Dharma Yoga Asana mini-class. I am also doing some half-day intensives with raw vegan dinner afterward. All info can be found on our website. How has your experience in the Dharma Yoga LOAY program affected your life outside of training? The name of the program “Life of a Yogi” is exactly that and has turned me into an aspiring Yogi. I went from a drugged-out meat eater, deluded, with total lack of self-control to a person that my family and old friends have a hard time recognizing. I don’t think I will ever look back to this time and think, “Oh well, you know…I was young.” I can’t imagine going backwards from this point. The love and discipline and other qualities that Sri Dharma and my other teachers exemplify is so far-reaching that Self-Realization seems the only way out! What books are you currently reading or studying? Yogic Powers by Yogi Gupta (because it pertains to my 800-hour training and Psychic Development). Plus, I am always reading and re-reading the Gita. Check out the Vitality Café on Facebook for beautifully styled and delicious vegan food. Of all the Niyamas, Svadhyaya has left a lasting impression on me. One particular image is ingrained in my mind when I think of self-study: the notion of a journey. I daydream about an expedition or a grand voyage. Svadhyaya is a spiritual study, a tour of one’s deepest thoughts, ideas, and fundamental nature. It is the study to know oneself in an effort to understand why we are the way we are and catch a glimpse of our Divine Self. It is independent of the thoughts and ideas to the world around us, when one can study the self with a mind free from the disturbances of outside forces. Spiritual study then can help unlock our understanding of who we are as well as our relationship to the outside world. A vital part of Svadhyaya is the fact that we are not alone in our journey to the Self. Others have gone before us and succeeded! 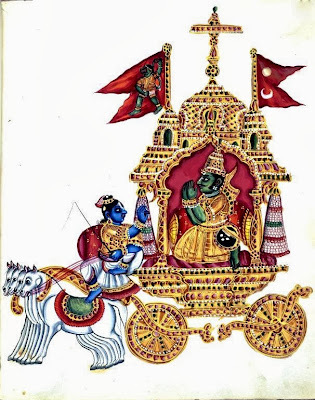 There is no doubt that history and literature show us that Svadhyaya occurs from generation to generation: From Jesus to Buddha, Siddhartha to Arjuna, all of these figures embarked on a journey. While some were geographical, all were metaphysical and in an effort to truly study the self. Iyengar also said “spiritual realization is the aim that exists in each one of us to seek our divine core. That core, though never absent from anyone, remains latent within us. It is not an outward quest for a Holy Grail that lies beyond, but an inward journey to allow the inner core to reveal itself.” Here, Iyengar describes Svadhyaya as being a journey to the self, a journey inward so as to truly find our divine core. In BKS Iyengar’s, Light on Life, we are taught that “to know one self is to know one’s body, mind and soul.” There is no better way to understand the Self than by first taking a glimpse at those who have passed before us and studying with our hearts, then delving deep into our thoughts, ideas, and emotions without judgment or fear; but with an open mind and an open heart. In that vein, part of my attraction to this particular Niyama came about from my father’s inspiration. At 40 years old, with two children approaching university years, a mortgage and a wife, he chose to open his own business. It was through self-study that he realized he was tired of doing things other people’s way. Now, 19 years later, he is peacefully removed when he speaks of his spiritual study, as though it was merely a necessary step in becoming the man he always envisioned himself to be. His spiritual study throughout that time in his life and the many prior years, led him to take a gigantic leap off of a cliff, a leap in which he did not know if there was water or land below. He simply leapt and fell into an abundant pool. While he admits that Svadhyaya was arduous, he cannot imagine it being any other way. He studied every day in order to manifest what he wanted in his life. So why is it that so many people (myself included) are afraid of going inward to discover what is on the inside? Funny enough, the answer to that question lies in going deeper into self-study and allowing discoveries to occur independent of whether it is good or bad. For example, last summer I took a Chakra workshop in which I was asked to dive deep into the self to discover how I dealt with milestones from my early childhood to present day. Many emotions, from anger to elation, frustration, and guilt came to the surface. But how was it possible that all of these emotions lay dormant in me? It was as if they were camping in my back yard and I had no idea they were even there! Perhaps then I would have no control when any one of these emotions would come out. I was furious. This was my first real attempt at Svadhyaya and because of it, my inner core is no longer latent and has begun to reveal itself to me. With the help of further spiritual study I feel that the universe and its predecessors have been supporting me in opening up in further Svadhyaya. It is true what Sri Dharma Mittra says: “Be receptive and all is coming.” Especially in Svadhyaya! Danielle Lydia Sheather first found yoga through dance, and thanks her primary dance teachers and several others for introducing her to yoga without ever really knowing what they were doing. She has been to every continent dancing on cruise ships and on tours. Danielle has since been in NYC for 3 years, the longest she’s been anywhere since high school. A self-proclaimed nomad, she loves to travel but decided to lay down some roots for a while. Danielle graduated from Sonic Yoga’s 200-hour teacher training in 2009 and from the DYLOAY 500 Hour program in 2012. She has taught in Bed Stuy at St John’s Bread of Life, Yoga on the Rooftop, Sonic Yoga, The Giving Tree Yoga Studio, New York Yoga and the Dharma Yoga Center. She is also the ballet mistress and choreographs for Dance Dimensions in New Milford New Jersey and continues to perform here in NYC. She believes that it is a teacher’s responsibility to continue to practice in order to grow, understand, and honor their commitment to enlightenment thus being a student of life! PS: She is also fluent in French Canadian. 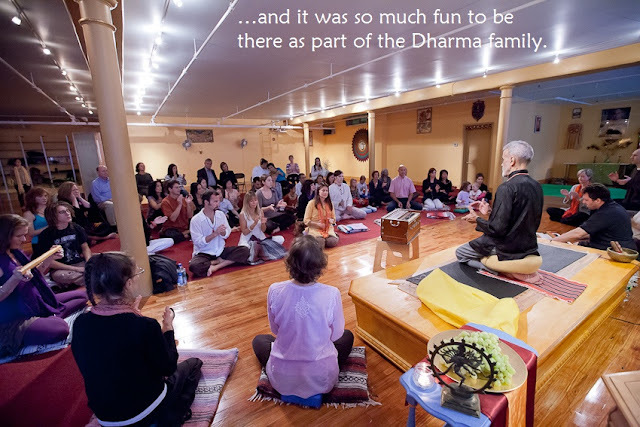 Twice a year, the Life of a Yogi Teacher Training team gathers together to honor the trainees who have completed all their requirements to become certified Dharma Yoga Instructors. Sri Dharma himself presents the certificates, and friends and family are always invited! Below you’ll find a collection of photos from the recent graduation in October, and some reflections from five of our 200-hour graduates (Kelsey Tangel, Amy Stinchcombe, Elaine Kantanas, Sabrina Vigilante, and Mike Hazzard). All photos by Gabriela Luiz; quotes attributed following each image. …It is where I learned firmness and resolve in my practice and in the great practice of daily life. It is where I turned a corner in my life to understand in the most profound way that there is a Great Intelligence woven into the fabric of all of creation and that everything is intimately connected. I’m pretty reluctant to even write this blog entry right now, because that will make it feel like this whole experience is actually over… Last module, the last day was so much easier, just knowing that we’d all be back in two short months. I was saying to somebody the other day how I wish I could do this eight-day intensive experience every two months for the rest of my life; it’s just what I need to ground me and remind me of all the reasons why I aspire to be a Dharma Yoga teacher. Today was a perfect ending to the training. We started with pranayama and dhyana with Sri Dharma, followed by spiritual discourse. 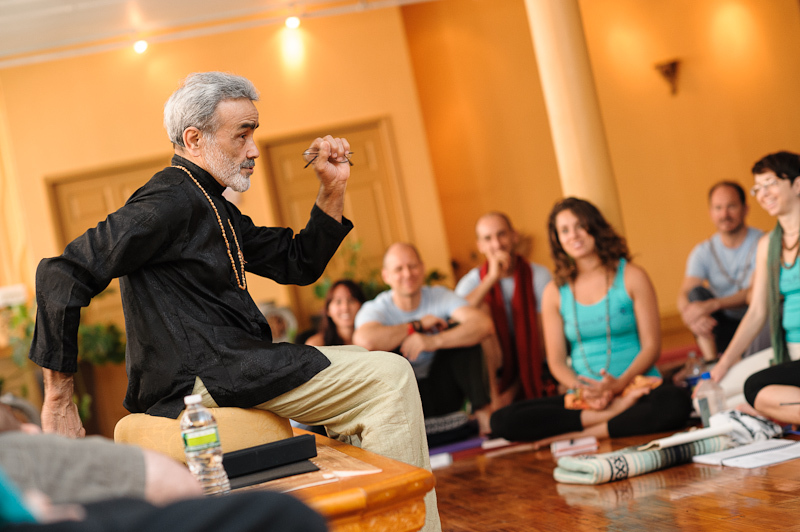 It’s sort of hard to explain the things covered in spiritual discourse, because somehow, every single lecture, Sri Dharma gives us the very essence of yoga, and at the same time gives each of us exactly the thing we need to hear at that moment. I am more amazed as I watch it over time, because it never fails. We had a partner yoga workshop after discourse (lots of fun pictures below), and then Dharma IV with Yoshio – the last asana practice of the training. I felt like I was just giving everything in that class. It’s sort of interesting how hard you work when you know you’re coming to the end of something! After lunch we had an oral final exam, which was not nearly as stressful as it might sound. We did it in our small groups, and we just had a few general knowledge questions, some asana demos, and some assisting and adjusting situations to work out. Then we went over the internship guidelines with Adam… I think if I hadn’t already done the 200-hour that discussion would have stressed me out a little bit, because it looks like so much on paper. I mean, it IS so much, in real life as well as on paper, but I know from experience that it is manageable, and it will happen in time. Then we had the closing satsang and received our completion certificates for the contact hours of the training. We opened the ceremony with some kirtan, of course, and I have never felt more joyful. I feel like this week has sort of just washed over me, and it hasn’t hit me yet that everything is finished… Because I think it sort of isn’tfinished, you know? It doesn’t sound like much, reading over what I’ve written here. But this teacher training has changed my life, and will continue to influence my choices and my path probably for the rest of my life. Throughout my college years, when I was studying dance (which feels like a whole other lifetime now), I used to go to intensive summer programs where I’d get very close with other people… And of course we’d all be sad when they were done, but that was just nothing compared to this. The people I’ve met here are just beyond compare; the level of resonance and familiarity was astounding even from the very beginning. Dharma Yoga teacher trainings are pure bliss – there’s just no way to put it into words. I could go on and on about how wonderful the whole thing has been, but I think Sri Dharma said it best (as always): You learn about something, and then “you have to check it out for yourself”. Kim and Yoshio demonstrate some GORGEOUS partner yoga. We’ve been told several times this week that we look like sisters. Spiritual sisters, maybe?